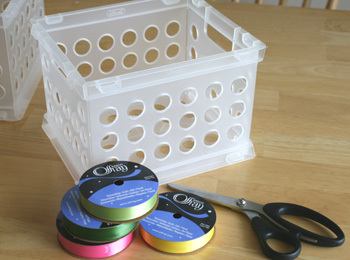 Make and Takes blog has a great embellishing tutorial for those $1 containers you can find at most stores. We love the idea of using all of our various ribbon pieces to make these pretty!! Take your cut ribbon and start at the top, weaving through each hole. Make sure to leave at least 4-5 inches at the outer end to tie into a bow when it’s done. 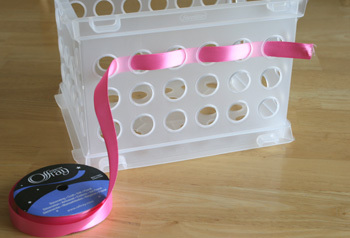 I chose to do three colors of ribbon, one for each level of holes on the container. But you can easily use one long piece of ribbon for the whole thing. Weave the ribbon all throughout the container. Once the ribbon has gone through each hole, tie the two ends together in a bow. My son made one for his room to hold his CDs. 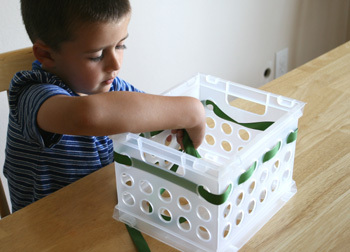 He liked threading his green (always the color green) ribbon through the holes, making sure not to miss one. 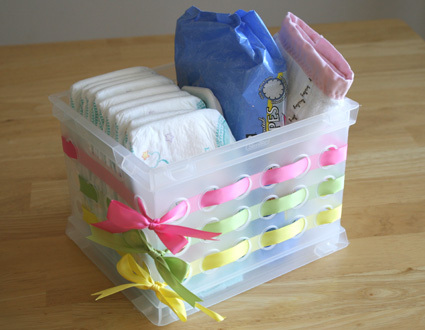 These are easy to create and would make great gifts for anyone needing a container. I’m thinking teacher gifts!